I couldn't tell you why we so enjoy reading perilous chapter books during this season but it's definitely a pleasure that we find no guilt in. There's something about a spooky chapter book that is simple and frightening at the same time and these tales sometimes inspire more emotion than some of their complex adult counterparts. Since this is our third year of reading an Eva Ibbotson ghost story during the RIP season, I think Z and I have firmly established a fall bedtime reading tradition. 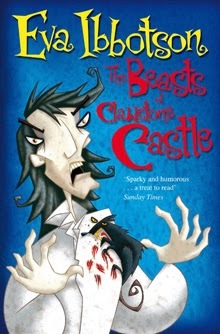 This time is was The Beasts of Clawstone Castle, a relatively recent book from 2006. It's the story of an elderly brother and sister who are trying to keep their family home (castle, really) from being bulldozed, their unique herd of white cattle from being displaced from their safe grazing grounds and the entire beautiful property from becoming a large tract of low-cost homes. Their young niece and nephew come to stay and come up with the idea that the only way to save the castle is to get a few terrible ghosts to come and turn the quiet home into a haunted abode to attract more tourist dollars. The plan seems to be working properly until some government-types come and tell them that the herd of cattle is infected with a highly contagious disease. While full of ghosts and dastardly neighbors and castles, the most frightening and grotesque thing in this story was definitely the animal abuse. It is obvious what Ibbotson's feelings were about the handling of the British "mad cow" outbreak of 1996. But, while I think it's important to bring attention to the wanton disposal of living creatures, I'm not sure that an actual description of killing cattle with a bolt gun was necessarily a good choice for a children's book. Still, we really enjoyed this story and were once again enchanted by Ibbotson and her weaving of the modern world and all of its amenities with the ghosts of prior generations and a thread of social conscience. 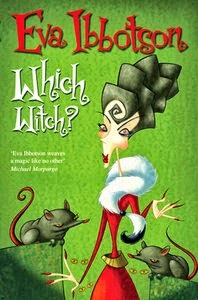 On my own, I read another Ibbotson book, Which Witch?, during the read-a-thon. I decided that Z might not be completely interested in a marriage contest between witches, vying for the hand of a dark wizard. But after reading it, I can't see any reason why he wouldn't like it. It's an amusing story with lots of bizarre characters and some fun creatures. In this book, Ibbotson has a lot of fun and doesn't really tackle any heavy issues (though there are a couple of dark magic scenes). I do wish that, as this book was published in 1979, I had found a copy of it in my childhood library. Unfortunately, my library was lacking when it came to British children's fiction (not surprising in a Los Angeles suburb in the 1980s). I do think I will try and get Z to read it sometime or maybe we can use it as our Ibbotson read next year. There are no ghosts in it but I'm sure I can get his attention with a baby kraken. I finally picked up Greenwitch, the third book in Susan Cooper's The Dark is Rising series. By bringing together Simon, Jane and Barney from the first book and Will Stanton from the second, along with Uncle Merry and a trip back to the fishing town of Trewissick, this was a quick and exciting read about the fight between the forces of good and evil. I think I will read the final two books this winter. I enjoyed a reread of Coraline during the read-a-thon as well. I had only read the story once before, slightly before the movie version was released in 2009. It was also my first Gaiman novel, read after working through the Fragile Things short story collection but before I was completely familiar and comfortable with Gaiman's prose. Reading this book again as a true fan was a much more meaningful and enjoyable experience. I adore this story. I love the movie as well but I still do wish it had been more faithful to the original. 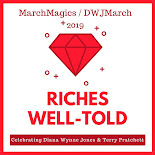 Finally, Z and I read Roald Dahl's The Witches together but you're going to have to wait until Halloween to read our thoughts on it over at The Estella Society as it was also a Top 100 Chapter Books selection. I have not read a single one of these! Though I have really, really wanted to read The Witches and Coraline. One of these days, I will actually get to them! I REALLY need to read some Ibbotson!! Like sooner rather than later. I don't know why I haven't read anything by her yet. Be careful! Once you start, you won't be able to stop. Aw, I forgot about the baby kraken! I should reread Which Witch, I remember it being completely lovely. The Witches, meanwhile, remains one of the scariest books I have ever read. Z must be made of stronger stuff than I was at his age! I think it helped Z to read The Witches together! There were certainly a lot of things to make kids extremely uncomfortable -- oh, Roald Dahl! Awesome spooky picks! I agree with Jenny that The Witches is very scary, but I have to say Coraline tops the scariest books list for me. I think it's brilliant. Greenwitch is my favourite of the Dark is Rising series--I prefer the Simon, Jane and Barney books over the Will Stanton books and I love the character of the Greenwitch. Love Ibbotsen, love Which Witch--and I haven't read Beasts, so thanks for pointing it out! 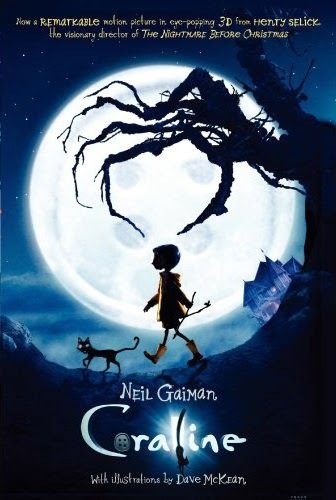 Yes, Coraline is frightening! It was much more so the first time for me than the second but still, it was awesome. And I loved Greenwitch. I don't know how I missed this series before but it's great! I've definitely been pleasantly surprised by the range of Ibbotson's books, from ghost stories with a message to older-middle-grade girl adventures to "just for fun" books. She does them all so well!